Only God can turn a mess into a message, a test into a testimony, a trial into a triumph, a victim into a victor. If you get to reading the bible, you realize it is such a novel and if you are a visualist, then it is a pretty amazing movie. King David’s life is one of the stories I find so interesting. In this chapter, there was a giant taunting and pressing the Israelite camp. Everyone was pretty scared, even king Saul and all the warriors. But David who would take food for his brothers at the warrior’s camp, would observe the giant ridicule his people. Except that one day, on the 40th day, David said “enough is enough. I will fight this giant. I’ve killed lions and bears, when they attacked my sheep. I can take this giant, just like I overcame those big animals when they attacked. I will overcome this giant”. King Saul doubted David’s training and ability; and even prevented him. David did not get offended, neither was he defiant, he simply stated his case. He was confident in his life experience; he considered it training. “I’ve been in the background keeping sheep, and protecting them from vicious attacks.” In my own words, his thoughts must have went something like this: you may not know me or my background, but I’ve been paying the price. I’ve been walking with God. You may have never seen me, yet you know my brothers because they are in your army, but I don’t need anybody to know me- I do not want this giant to make fun of my people and get away with it. I know I can take this Goliath guy. God will give me the victory, just like He has in the past. David faced a giant, but he only had experience having fought lions and bears. Maybe in our past, or before we were Christians we experienced certain things which prepared us to fight today. We don’t know the future, we have hints, but God sets the future. God knows what experiences we need, because He has an appointed time for the manifestation of His purpose (in His sons and daughters). Although spiritual battles are different from the physical, God prepares us in advance, depending on our calling and purpose. You may never have to deal with money issues, because money may not be of much use to you in the future. Maybe the fact that you are enduring sickness, is a hint that you will birth the gift of healing for your call and purpose to manifest. Maybe enduring seasons of loneliness will birth a sincere compassionate heart in you, and remove the ego driven perfectionist in your personality. Spirituality is about character, more than it is about knowledge or how much God uses you. David was anointed at a young age, maybe in his teenage years but did not become king of Israel until he was in his mid thirties. His character enabled him to push through all his trials, even if he failed God. If he had poor character, a victim mentality, a rebellious will or even a prideful attitude- he would have lost the kingdom of Israel, just like Saul. I go through situations where I think ‘wow, I fell again‘, or “I never thought I would do something like that“, and I’ve even considered walking away from everything thinking, “man, I do not even know why God called me, I don’t know if I can ever be a sanctified person“. But the truth is that I do not like to give up, I get up again. This is a character trait I believe God developed in me. David, Peter, Elijah and so many of us fail God, but eventually shake off the slumber and go at it again. If you think you can’t make it, you need to examine your confidence and determine your value. Because over-comers are assets: extremely worthy. God wants us to gain from our tests and trials. 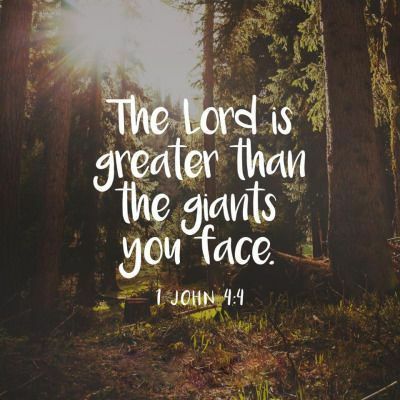 Remember that, and hold on to that for the giants you will be facing. What is your stance when the enemy is making fun of you, and your loved ones? What is your reaction to God’s testing of your faith? Are you angry, are you rebellious, do you unloved, are you sorry for yourself? 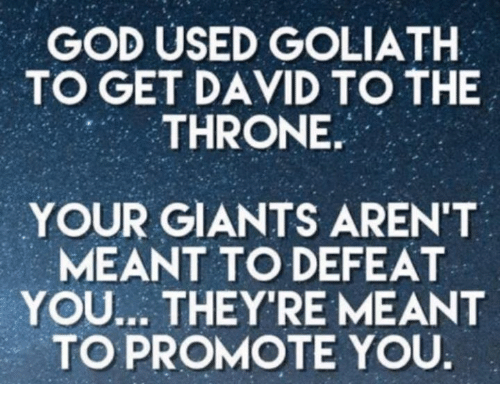 In conclusion, David did not only fight one giant: he went on to fight 4 other giants. These giants came to the defense of their brother Goliath. A resemblance of the spiritual world we are battling, demons attack in gangs. And we simply need to fight back. I want us to think about that today, and moving forward. God bless you. Lord God may we see the glory in the sufferings; may you continue to produce perseverance, character and hope in us. Because your desire is not that we live lives of shame, calamity or desperation but lives of love and of hope. May we possess our souls by our perseverance. May hope be the anchor of our souls, revive in us any place that has died along the way. Any place that has wasted away from the last fall, or is still wounded or bleeding from the last time we were defeated. In Jesus name, Amen.